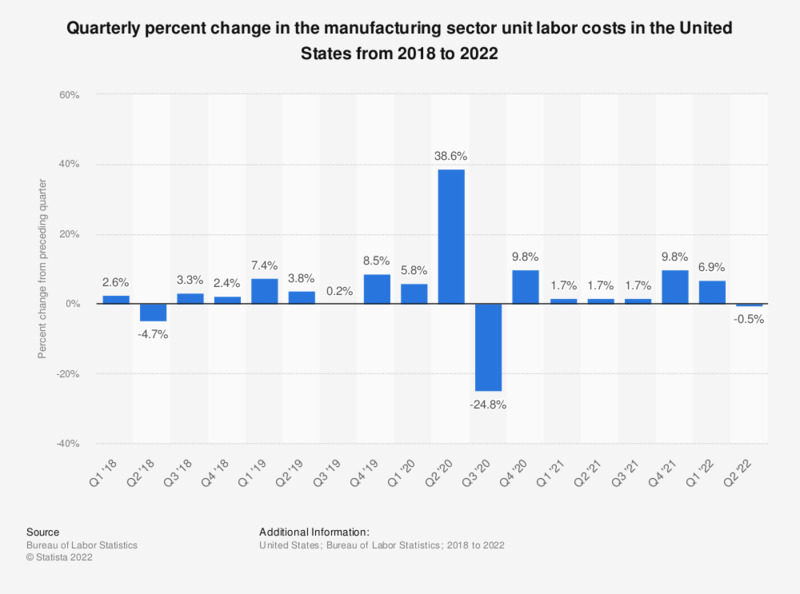 This graph shows the quarterly percent change in the manufacturing sector unit labor costs in the United States from 2016 to 2018. The data are seasonally adjusted at annual rates. Unit labor costs describe the relationship between compensation per hour and productivity, or real output per hour, and can be used as an indicator of inflationary pressure on producers. Increases in hourly compensation increase unit labor costs; labor productivity increases offset compensation increases and lower unit labor costs. Manufacturing sector unit labor costs increased by 2.2 percent in the fourth quarter of 2018. For a detailed explanation on the methodology employed by the Bureau of Labor Statistics to calculate the data see here. Statistics on "Average wage and salary in the U.S."